This recipe has a few surprises. My requirements for dinner included using an eggplant, a red pepper, a stalk of broccoli, and some leftover tofu. This turned out to be really fun and easy, despite the copious amounts of dishes it seemed to leave me with. I’m sure I could have made it in a more organized fashion had I not been making it up as I went along. The sauce you see is not tomato, it’s simply a single red bell pepper, pureed raw, with a pinch of salt. I need to remind myself every once in a while that it’s not necessary to cook every single vegetable I want to eat. It added a nice sweetness to balance out the salty roasted eggplant and sun-dried tomatoes in the couscous. Yup! That’s couscous in there, too! Can you guess what the green bit on the top is? Pureed, steamed broccoli! This was such a fun way to eat broccoli, I want to buy more immediately so I can blend it up again and use it in odd places. Forgive my enthusiasm, but there’s something about this light, bright green broccoli fluff that makes be a bit giddy. Preheat oven to 425Âº F.
Rub eggplant slices in salt and oil, place in one layer on a cookie sheet, and bake for 20 minutes. Flip, bake for 10 more minutes, remove from oven. Meanwhile, place couscous and tomatoes in a small pot with a dribble of vegetable oil. Toast over medium heat until fragrant, add boiling water, cover, reduce heat to low. After 10 minutes, turn off heat. Puree your pepper in a food processor until very smooth. Add salt to taste, set aside. Steam broccoli, puree, add pepper to taste, set aside. Toast pine nuts in a dry skillet. Mix together tofu ricotta, heat in mircowave until hot, set aside. Place a bit of the pepper sauce in the middle of the plate. Add a slice of eggplant on top of that. Add a layer of tofu ricotta and a layer of broccoli fluff. Add another slice of eggplant. Add couscous and broccoli. 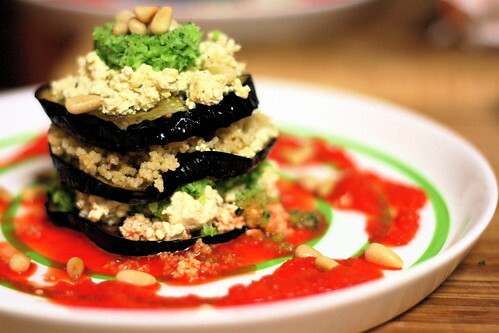 Add the last slice of eggplant and top with tofu and broccoli. Garnish with toasted pine nuts. Yum! I love how fancy yet unexpected this dish is! Just ran across your blog and LOVE IT! This recipe looks so YUMMMMMMY too! I’ll be back! looks very elegant and yum! That is so pretty. I’ve always wanted to harness the power of broccoli fluff! Beautiful! I love stacked eggplant (and stacks in general)! Making it up as you go along is the best way to do it! Just when I think I’m being cool for making something vegan for dinner, you go and invent a freakin’ NAPOLEON. You’re all too much! Thanks for your comments! Great idea, I’m going to be doing a variation on this for a dinner party tonight! Thanks! and I don’t see any credit. thought you might want to know. i just made this for my family tonight and it turned out a great. it made a very light and delicious summer meal. I am making it now, & i have 2 say its amazing just 2 taste the couscous/ sundried tomato combo! im going 2 serve that as a side sometime. i used the ones w/ oil in a jar. to make riccota tofu, as i am vegetarian, i added riccota w/ silken tofu, & threw in 2 laughing cow low fat garlic’s! next blog should be me. Turned out delicious. very good flavor combinations. i should have cooked the eggplant longer. i only did 10 & 10. it looked done, but that eggplant skin is tough. not cooking it long enough made it difficult 2 eat because of that, but it was so appitizing & interesting! the only other thing id change is after stacking, i think it should go back in2 the oven longer so the flavors could merry.